Louise Metivier has a tough job. She’s Canada’s chief climate negotiator leading the Canadian delegation at the climate talks. Here’s raw, unedited footage from Paris of her briefing the media on how global climate talks actually work. Originally published in Clean Capital. In the depths of Lake Ontario, giant underwater balloons are set to store some of Toronto’s excess energy. Toronto-based Hydrostor activated what it claims is the world’s first underwater compressed air energy storage system last week. The system uses compressed air to store energy generated during non-peak periods. With a capacity of 660 kilowatt hours, the underwater balloons can store enough energy to power 330 homes. During non-peak periods, excess electricity is passed through an air compressor. The compressed air is then sent through a pipeline from the facility on Toronto Island to the underwater balloons in Lake Ontario. When energy is needed, the process is reversed. The weight of the water pushes the compressed air back up the pipeline, where an expander converts it back to electricity that can be fed back into Toronto’s electrical grid. Toronto Hydro will operate the facility. The underwater balloon system produces zero emissions and conserves heat from the compression process to be reused. Commercially viable energy storage technology is a key to establishing mainstream renewable energy. The amount of energy renewable sources produce often varies depending on weather conditions, which creates a need for reliable storage. But some storage options can only be used in particular locations, including pumped hydro, which involves pumping water from low to high elevations to be released when energy is needed. The underwater balloons are meant to be more easily scalable for projects of different sizes. The interest in energy storage has increased in recent years. In May, Silicon Valley innovator Elon Musk announced the Powerwall, a rechargeable lithium-ion battery for residential homes. The commercial version, the Powerpack, is also available for utility companies. A large Californian utility also recently decided to build a battery plant over a natural gas power plant. Ontario leads Canada in energy storage initiatives. In July last year, the province announced 34 megawatts of energy storage projects with technologies from flywheels to thermal energy storage. In August 2014, Oshawa Power installed thirty rooftop solar panel and battery storage units. And other provinces are taking note. Alberta Innovatesfunded six energy storage projects in the province this year. Hydrostor hopes to sell its system to coastal cities and island nations making the switch to renewable energy. What’s sustainability to a tree? I head up to Cortes Island in Desolation Sound, B.C., to meet the folks who started the Cortes Community Forestry. Payday lenders are a problem. This Walrus article made me blink. I’ve always imagined predatory lending to be a more-or-less foreign issue with only minor Canadian implications. Not so much. 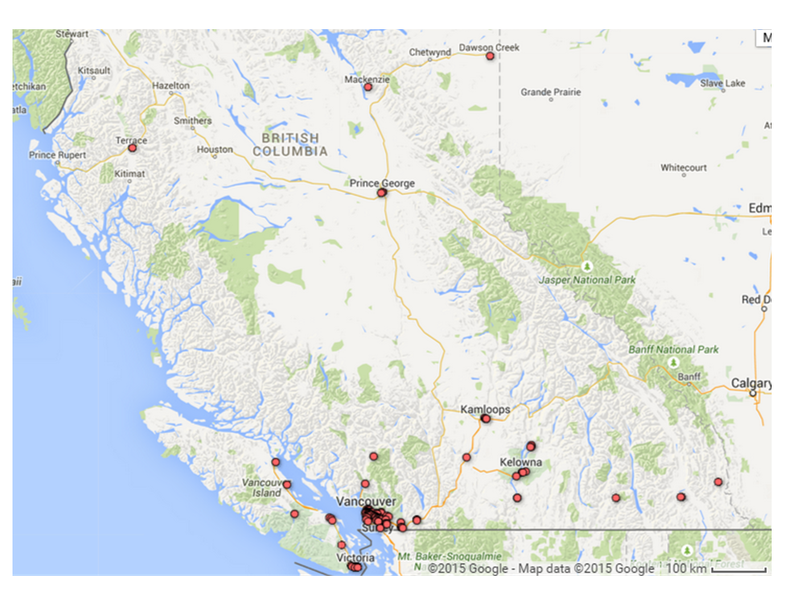 Here’s a geographical look of the extent of payday lenders in BC, divided by opening date. We’ve seen a steady increase of payday loan retailers over the last 6 years. 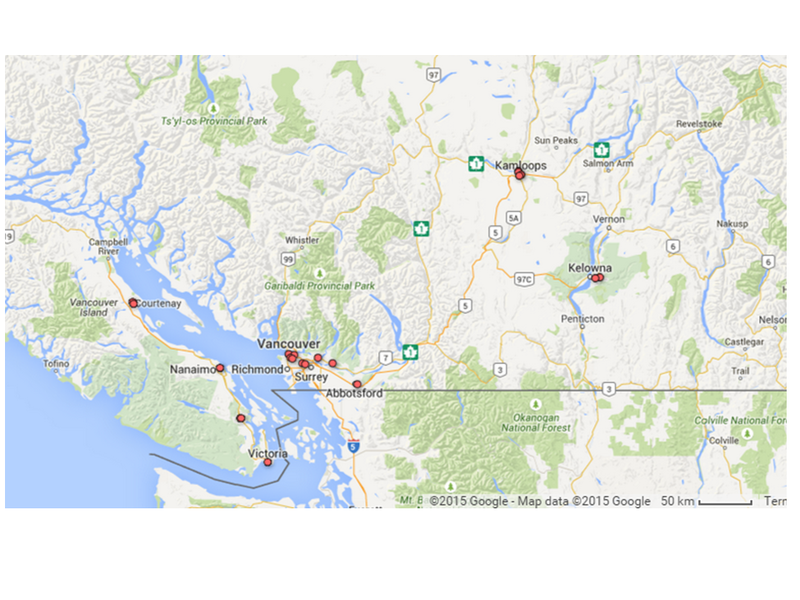 What’s perhaps most surprising is their geographical spread – these aren’t just a phenomenon of the population-dense Lower Mainland. In Fort St. John, you too can gain an albatross of a high interest loan. 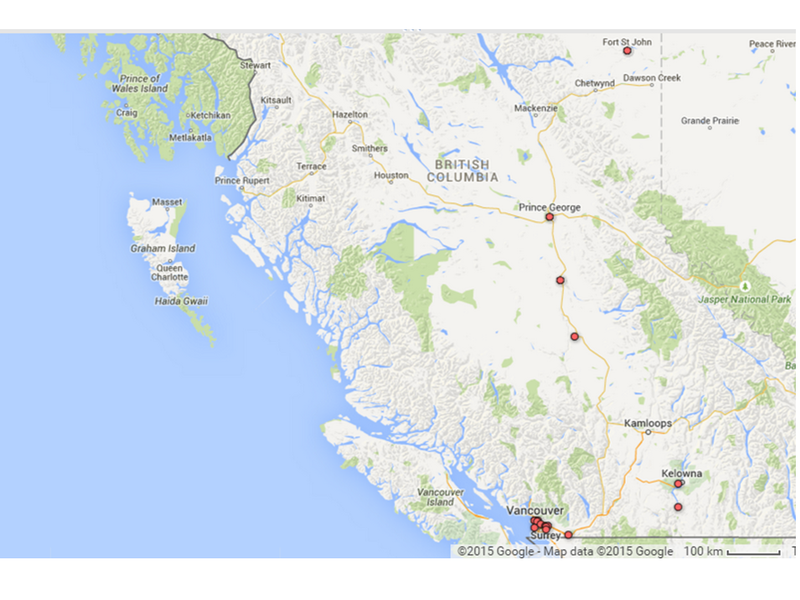 Data from Consumer Protection BC, mapping done in Google Fusion Tables. See the raw data here. Have we been talking about climate in the wrong way? The climate conversation is stuck. In almost every Western country, climate change has become a battle between the left and the right. Stop to think about that for a second. But as Russell Kirk said, nothing is more conservative than conservation. It doesn’t make logical sense that conservation of our standard of living in the face of climate change has become an issue that is so polarised along political lines. We recognise that the person-to-person discourse needs to change, but we haven’t made attempts to shift the discourse at the level of nations. We’ve seen two movements trying to change the person-to-person discourse, one each emerging from the left and the right. There’s the divestment movement, spearheaded by Bill McKibben, that calls for us to all wash our hands financially of oil companies. Then there’s Bob Inglis, as card-carrying of a Republican as you can get, advocating free-market solutions to climate. But at the level of nations, we’re stuck. The only solution to climate change we’re discussing now is cutting emissions. The current climate discourse is a discourse of constraint and of frugality. Unappealing, and ineffective. I heard an interview with Professor Steve Rayner of Harvard who noted that if we had decided to talk about climate change in a different way, we could have made larger strides towards mitigating climate change than we have now. The largest lesson I took away from his podcast is that our climate discourse is taking place within a certain framework out of many possible frameworks. It’s like your doctor telling you to eat more veggies and offering only steamed cabbage as the possible solution. The current framework isn’t working. Ever since Kyoto, the focus of international treaties has been of emissions reductions targets. In Paris, the goal is to “build a tangible, credible action plan, along with clear targets”. In Canada, the prime ministerial candidates attack each other for whether they plan to cut emissions down to Kyoto targets, and by when. Professor Steve Rayner has a good point – climate change has become an avenue for us to pursue specific political preferences. More explicitly put, the only solutions for climate change discussed now are those that the left would embrace and the right would not. On a world scale, we have China hesitant about its sovereignty. No, China says, we don’t want you to come in and scrutinise us and how we do things and tell us what we can and cannot do. Understandable. Try spending a day with your mother looking over your shoulder and tsk-tsking. Canada’s not all that much better. The amount of respect the left has for the right is barely enough to fill a balloon. The most valuable aspect of Professor Rayner’s excellent lecture and podcast on the Guardian’s Science Weekly stream is the focus on how the climate discourse has been formed and how that format is stalling the conversation. US sulphur trading: Enormously successful. But they were dealing with a small number of traders, with one single regulatory regime, just sulphur. There’s a huge number of greenhouse gases, more than just CO2. Strategic weapons reduction treaties: Mutually verifiable stage reductions. But China hates this, and culturally, that makes sense. Canada would dislike it as well. Same as the states. Again, imagine your mother looking over your shoulder. Yes, these seemed like viable and natural sources of inspiration for dealing with climate change. But they’re not. And now we’re locked in a discourse of frugality. Don’t call it “cutting”. Call it “modernising”. Professor Rayner had a good point. We don’t have to all agree on why we do something. That doesn’t matter. We just have to agree to do it. So instead of cutting emissions, let’s modernise our energy technology. That has a better ring to it, doesn’t it? Now climate change is no longer a discourse of constraint but one of improvement. Modernising technology makes me think that my standard of living is going up. Cutting emissions? That makes me furrow my brow. It can appeal to a whole range of parties with different interests. A firm Conservative who believes strongly in the free market? The market is instrumental to innovation. A social justice advocate? Alleviating poverty and reducing environmental degradation requires reliable sources of energy. For firmly sovereign states – “we don’t want anyone telling us what to do” states – having independent, reliable sources of energy is a key priority. That sounds a lot better than doubling down, cutting emissions, increasing government regulations, and holding each other accountable. Re-read the previous paragraph again. My response is to sigh in resignation. It sure may be unnecessary, but it will be unpleasant. It’s a discourse that smells of limitation and looks almost suspiciously tailored to the concerns of the left. What should our new framework be? We don’t have to focus on reducing emissions in order to reduce emissions. There has to be elements in the framework that different parties can value. There are a couple of options. Professor Rayner’s suggestion is modernising technology. For agriculture, we could talk about investing in long-term methods that would ensure continued yield. For finance, we could talk about the security of investments. Here’s the meat of it: our current discourse is not working and we’re not stuck with it. Let’s find another way of dealing with the issue. The environment-economy dichotomy dominates all climate discussions. That’s where my interest lies – let’s whip out the magnifying glass and probe this dichotomy. I like hiking. I also like warm showers and nights in the city. Pick one, but not both, because you can’t have both. Or so they say. I picked up a copy of Jeff Rubin’s The Carbon Bubble on how Canada can actually benefit economically from climate change. He has something worth saying. Check out his interview with CBC’s Anna-Maria Tremonti. Here’s my one-line book review: insightful, a little alarmist, but well-worth the read. Rubin’s argument is that the oil sands will sink our economy. Given changes in consumer behaviour and the volatility of the oil market, placing all our eggs in the oil basket and very them firmly keeping there is folly. Here on out, we should focus on two assets with real value which we have in spades: farmland and water. Rubin’s mixed bag of credentials both buoys him and drags him down like an albatross. He did worked at the CIBC for twenty years, but in 2008 he predicted – loudly and wrongly – that oil would hit $225 a barrel. Read his arguments and double-check his sources. He raises many good points. Here’s one of many that caught my eye. Bitumen is costly to deal with. Very expensive. In November last year, Ed Morse of Citi Research noted that investors were pulling the plug on projects that require $80/barrel to break even. 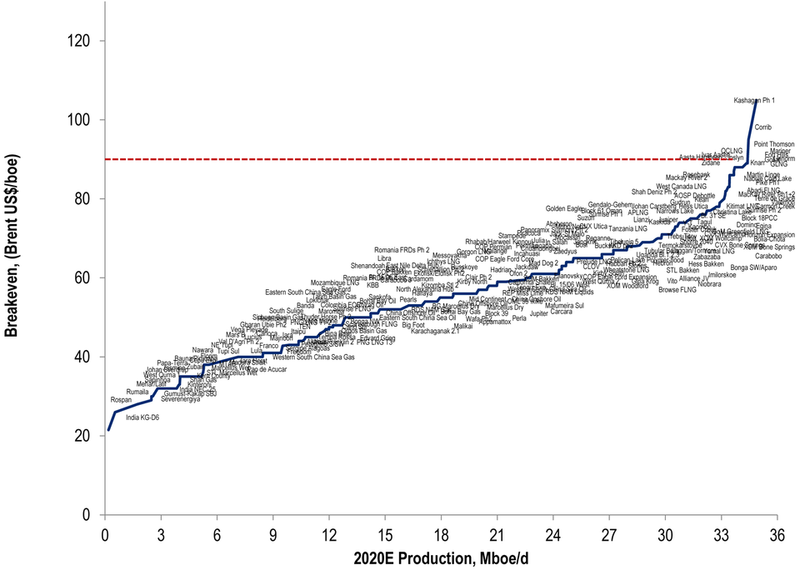 Here’s a chart of the break-even costs of every international oil project through to 2020. Mackay River and Nabive Cold Lake are above the $80 mark. Rubin makes the claim that Goldman Sachs, Wood Mackenzie, and CERA have pegged most new projects past $80/barrel. I’ll try digging up more actual sources on this. We’re now at $43.14/barrel. Check out this NASDAQ chart of oil prices going back 8 years. We’re at just about the same level now as right after the 2008 crash. Prices were at their highest of the last eight years in mid-2008 at $140/barrel. Imagine how furiously heads must have been nodding to new projects at that time. Here’s a question: if oil could hit $140/barrel, does that mean we’ll bounce right back high prices? Rubin makes the valid point that in 2008, China and India were growing at 10% and 8% each year. China’s now at 7.4% and its GDP growth has been falling ever since 2008. India is also now at 7.4% and has been slowly growing after it hit a valley of 5.1% in 2010. Other factors to look into when considering the economic viability of the oil sands: cheaper shale gas projects in the US and how we would move the oil – if we can’t move it, we can’t sell it. Arguments for their economic viability? Look at how many of us drive. Talk to anyone who lives 30km outside of a downtown core. Plastic, airplanes, food, etc. The bottom line? There is no easy economy power-up. There’s a lot to do before we can dream of long-term prosperity. When you enter the new online documentary video game Fort McMoney, created with actual video footage from Fort McMurray, Alta., scenes of doom greet you. The sky is an immutable block of grey, save for immense columns of smoke forming bridges from the factories to the sky. As you speed along the highway, the dark prevents you from seeing anything but the glare of the headlights of incoming traffic. Two pillars of light speed toward you and suddenly the immense bulk of an oil tanker truck is illuminated by your headlights, filling your entire field of vision through the windshield. Just as fast as it pounded towards you, it disappears, and is quickly replaced by another one. You learn later that Highway 63, the only highway between Edmonton and Alberta’s massive northern oil fields, suffers from harsh prairie winter conditions, is only one lane wide in either direction and carries some of the heaviest and most dangerous loads in Canada. Locals call it the Highway of Death. When I first meet Alex Hemingway, he looks me in the eye and gives me a firm handshake. If UBCC350, the student group of which he is a member, wanted to portray themselves as a professional group and shake loose the granola image that so often defines environmental activism, they could not have sent a better representative. With two master’s degrees from the London School of Economics under his belt and a PhD in the works, Hemingway is a credible representative for the group agitating for UBC to clean up its investment portfolio. The divestment movement is not unique to UBC. The idea of divesting from oil companies began in the U.S. and has spread across campuses in North America. The idea of divesting from companies as an act of protest also has roots beyond the current climate change debate. In the 1980s, students rallied for divestment in protest of the apartheid movement in South Africa. Divestment has also been used as a tactic more recently, with activists boycotting Russian vodka in protest of the country’s homophobic laws. UBC has just over $2.5 billion in its investment portfolio, and 12 per cent is invested in energy companies, according to UBC’s Investment Management Trust’s 2013 annual report. The two largest funds in the portfolio are the UBC endowment fund and the staff pension plan, each of which make up two fifths of the portfolio. UBC owns only the endowment fund; the staff pension plan is comprised of contributions from employees and government and is directed by a board of faculty members and advisers. Interest from the UBC endowment fund pays for scholarships, professorships, teaching support and other operating expenses. Everyone in the meeting room is dressed to impress. The two twenty-something men standing by the refreshment table are wearing suits and ties, giving them an air of formality. The juxtaposition is odd. We are in a meeting room at a community centre downtown, hardly the most formal venue in the city. The seemingly incongruous combination of venue and attire makes sense given the context. These people do, after all, spend their time managing the trillions of dollars of the one-percenters, and of the rest of us. These are chartered financial accountants, bankers, fund managers and investors, gathered to hear about a United Nations program to encourage sustainable investment, the UN Principles of Responsible Investment (PRI) initiative. UBCC350 and UN PRI both want to achieve sustainability, but their methods are markedly different. In an interview with The Ubyssey, Fiona Reynolds, UN PRI’s managing director, said divestment is the last step they advise shareholders consider — only to be taken when all else has been tried and has failed. Two key groups make the decisions in every major publicly traded company like Enbridge, the Alberta energy giant: shareholders and the management team. By purchasing shares, shareholders own a portion of the company, and therefore have a say in how the company runs. The more shares you hold, the more votes you get at the annual meeting where the company makes important decisions. Shareholders are essentially the employers of the chief executive officer (CEO), chief financial officer (CFO) and other members of the management team. The stick waved by shareholders in front of the management team is this: make money for us and do as you’re told, or we’ll fire you. The carrot to the management team for maximizing the profits of a company come in the form of payment and bonuses. In most cases, however, the management makes all the decisions itself, and only comes under fire if it fails to make the company money or becomes embroiled in major scandal. The UN group essentially encourages shareholders — like UBC — to engage with the management teams of companies in which they invest, encouraging them to act more responsibly and sustainably. The threat if management refuses to play ball is implicit rather than explicit, but still hangs over any negotiations: if you’re really not listening to us, we’ll fire you. However, like most organizations, the theory of who has control over the operations of a company doesn’t always play out in real life as predicted on paper. Apple CEO Tim Cook demonstrated this earlier this month. During a board meeting, shareholders told Cook they did not want him investing their money in activities promoting sustainability. Cook balked and effectively told shareholders to sell their shares in Apple if they disagreed with his vision of corporate responsibility to the environment. Shareholder engagement, in this case, failed, and divestment became the only option. But while trying to change corporate behaviour as a shareholder may not always work, critics say divesting from oil companies altogether, as UBCC350 advocates seems to be throw the baby out with the bathwater. Without any shares, anyone advocating for change in corporate behaviour might as well be a fly in a tent: the buzzing of the fly may be annoying, but its presence is of no real consequence. To understand this concept, we can think of Wile E. Coyote. During my childhood, I watched Wile E. Coyote try to chase and trap Roadrunner, his efforts always in vain. Many episodes ended with the iconic cliff scene: Roadrunner speeds along in front of Wile E. Coyote and, defying gravity, races straight across an immense gulf between the faces of two cliffs. Wile E. Coyote is in hot pursuit. He runs straight at the gap. He races past the edge. And then, of course, the fantasy ends. Wile E. Coyote inevitably pauses, looks down, and realizes that, unlike Roadrunner, he cannot defy gravity. He looks at the camera, blinks twice and waves. He plummets downward, and all viewers see of the aftermath is the dust cloud ballooning across the bottom of the canyon when gravity is done pulling Wile E. Coyote toward his doom. Advocates of the carbon bubble theory suggest that the stock prices and returns of oil companies are analogous to the run and fall of Wile E. Coyote. Look at the amount of carbon reserves oil companies count as assets that scientists agree cannot actually be used, they say. According to two papers published in the scientific journal Nature, three quarters of all known fossil fuel reserves must stay in the ground to avoid crossing the threshold to catastrophic climate change. Once the stock market becomes fully cognizant of this inconsistency, investors will rush to sell the overvalued stocks. At that point, share prices plunge. The lucky ones will sell their shares at a loss as prices fall. The unlucky ones will remain unable to find buyers for their shares at decent prices and the weight of their immense loss will add to the cloud of dust that rises from their collective fall. If this were to come true, it would be the obvious financial move for UBC to divest sooner rather than later. But assuming that continuing to invest in energy companies is in a fact a smart financial stance for the university to take — the prevailing view among many on both sides of the divestment debate — what should the folks in charge of UBC’s money do? Is it even possible that the divestment of public institutions will lead to concrete change in the behaviour of companies? Suppose divestment campaigns successfully persuade UBC and other public institutions to divest from oil companies. This divestment will not directly harm the companies very much, given the size of investments from private individuals and corporations. However, suppose other investors are persuaded that oil companies are undesirable investments for financial and environmental reasons. More investors sell their shares. Such a large amount of shares of oil companies would become available on the market that share prices would fall significantly. Remaining shareholders, alarmed by the falling value of their shares, might then put fierce pressure on company management teams to develop more sustainable practices and appease the market. If they continue placing pressure on management until the public is satisfied with the degree of sustainability of the company and purchase the company’s shares again, that could result in real change. “The financial divestment is important in the sense that that’s the mechanism through which people can take joint action and through which the stigmatization can happen,” Hemingway said. In 1972, Stephen Ross, an associate professor of economics at the University of Pennsylvania, laid out his economic theory of agency that has since, with great fecundity, become the foundation on which many analyses of social and market issues have been conducted. He termed it the “principal-agent problem.” The mathematical proofs in his paper reinforce a point that one can intuitively grasp: having someone else do work for you is difficult if they do not have the same incentives as you. Ross attempted to prove in his paper that given a very specific type of personal preference and a complex compensation scheme, one might be able to convince someone else to do a task with as much earnestness and effort as you would. However, the corollary of Ross’s theory naturally holds as well: most of the time, you can’t. Imagine you have been hired by College Pro Painters. You are assigned to paint the garage of someone you don’t know. All your supervisor is concerned about is that you finish the job by 4 o’clock, and all you know is that you are paid by the hour and that you are meeting friends at the Norm afterward. Are you going to finish the job as efficiently as possible? Probably not. If you can extend your work all the way until 4, you’ll maximize your profits. Similarly, the primary objective of any corporate team is to maximize profit. When profits are high, shareholders receive large cheques in the mail and their bonus is correlated with the size of their cheques. Unfortunately, sustainability and profits are often orthogonal goals. I sit down with Hugh Neary, a UBC economics professor who has always reminded me of Santa Claus. I wanted to hear Neary’s opinion not just as an academic, but also as a father with dependents and a pension that would be directly affected by university divestment — and unlike Santa Claus, he has a very real mortgage. His response surprised me. His primary concern with the divestment movement was not the risk of a drop in his pension, as I had expected. I had probed Hemingway on the topic in great detail in preparation. But only about 10 per cent of UBC’s portfolio is invested in energy companies. Divestment would protect UBC and its employees from the popping of the carbon bubble, and some studies have shown minimal to no impact on return given divestment. He sat in his chair and looked at me, holding his glasses in one hand and shaking his head slightly as I repeat Hemingway’s assurances. No, the potential drop in his return wasn’t his primary concern. Instead, he gave an example that illustrated his fundamental doubt of the divestment movement. Look at Walmart, he said — so successful it opened 37 new Supercentres in Canada in 2013. Despite its reputation for poor treatment of workers, among other accusations, people still shop at Walmart because of its cheap prices. If knowledge of a problem did lead to people taking action at their own expense to mitigate the problem, Walmart would have much quieter aisles than it does now. This is the crucial puzzle we must solve in order to succeed in responding to climate change. How do we persuade ourselves to resist the siren song of short-term personal gains and long-term detriment? The success of the divestment movement hinges on our ability to translate knowledge into action. If we know more about the consequences of our actions, will we really give up some of our personal gains for the sake of future good? Will we accept lower profits? Drive less? Buy fewer clothes? Eat less meat? Or will we only change the way we act if we personally benefit from it now? Hemingway pointed out that the ultimate goal of the divestment movement is increasing public awareness; divestment itself is only a means to that end. The crucial assumption of the divestment movement is that lack of knowledge is the largest barrier preventing action on climate change. I don’t think that’s true. Climate change is known to the vast majority of people. The Walmart example shows us that the largest barrier is not lack of knowledge, but our unwillingness to change our behaviour despite knowing the consequences of our current lifestyle. Increasing public awareness is only the first step that has already been done well; the challenge now is to convince ourselves to accept the uncomfortable knowledge we have and act on it. The sun is just beginning to set as Hemingway and I finish our conversation. For close to an hour, I had grilled him on the ambiguity of the actual impact divestment would have on climate change, the amount of risk to its return the university would face and technicalities of the finance industry. Hemingway answered my questions with clarity and precision and, at some points, frank acknowledgement when he had no answer. At one of those points, he looked at me and said that, eventually, we have to make a choice between questioning and researching, and actually choosing a course of action. And at some point, we do. For to not make a choice is to have made one as well. Originally published in La Source. Un monologue à propos de sa mère morte. Morbide ? Pas du tout. Le spectacle solo How To Disappear Completely, raconté en mode film, son et lumière, est à l’affiche du Théâtre Gateway du 13 au 22 novembre. Tout y est songé pour atteindre un équilibre. Le pouvoir de l’art pour intensifier nos émotions est reconnu. En 1951, lorsque la pièce classiqueUn tramway nommé Désir est présentée, la sensualité de la musique horrifie la Légion américaine de la morale, et le compositeur est contraint d’en changer. Quand l’art se penche sur le sujet de la mort de sa mère, où poser les limites entre l’évocation des émotions et la manipulation ? Peut-être que la réponse se trouve dans le succès du spectacle – Vancouver n’est qu’une parmi de nombreuses villes qui l’ont programmé. Mais la pièce ne plaît pas à tout le monde et s’est attirés quelques critiques négatives. En août, « A Younger Theatre », à Édimbourg, en Écosse, la qualifie d’« arrogante ». Pourquoi veut-on, demande le critique, choisir non seulement de parler de la mort de sa mère, mais aussi de l’affronter, de regarder sa progression, et de réexaminer sans cesse chaque nuit la décision de seconder son suicide ? Plus important, pourquoi voudrait-on que le public vienne assister à cette fin si intime exposée sous des lumières crues ? Une vie privée. Des thèmes universels. On ne connaît pas cette femme au cœur de la pièce, mais Erdal souligne que les thèmes abordés sont universels. « On a tous un frère ou une sœur qui s’engueulent », note-t-il, en parlant de sa sœur qui ne voulait pas qu’il filme la famille pendant neuf mois. Le public semble d’être d’accord. Le spectacle est passé par Montréal, Toronto, Londres, Edimbourg et Berlin, et il sera présenté à Athènes, ainsi qu’à Victoria. Erdal a même reçu une invitation pour le montrer au Zimbabwe. « Après chaque représentation, affirme-t-il, 30 à 40 personnes viennent me parler de ceux dans leurs vies qui sont décédés, de la découverte et de la perte de l’amour. Ils m’envoient des lettres en racontant l’histoire de leurs vies. » Erdal les touchent en profondeur avec son conte. Pour une rare occasion, des artistes urbains de Vancouver présentent leurs œuvres entre quatre murs, à la galerie Hot Art Wet City, jusqu’au 26 septembre. Ils le regardent avec un air perplexe. Parfois, ils tiquent. Mais Fred « Joy » Joyal s’habitue aux passants et poursuit son travail sans s’inquiéter. Dans la ruelle tranquille, seules les poubelles l’accompagnent. Pourtant, au moment de quitter les lieux, les meneaux jaune et bleu de Despicable Me sourient de toutes leurs dents, et leurs yeux blancs et énormes font facilement rire les passants. L’appartement de Fred Joyal est rempli d’œuvres ramassées aux quatre coins de la ville. Sillonnant quotidiennement les rues de Vancouver pour donner vie aux murs, il se joint en effet ce mois-ci à d’autres artistes du pochoir et du collage dans le cadre d’une exposition baptisée Streets. La galerie Hot Art Wet City a eu la bonne idée de mettre en lumière cet art urbain, dont on est plus habitué à ce qu’il essuie la poussière et la pluie. En comparaison avec d’autres grandes villes comme Montréal, Vancouver est quasi vierge en matière d’art urbain (bien qu’il soit difficile d’évaluer le nombre exact d’artistes qui s’y exercent, car le fait de s’annoncer comme tel peut avoir des répercussions légales). Il est vrai que le blogue StreetartMtl propose d’innombrables photos d’œuvres et de murales énormes qui avalent les couloirs et les ruelles bordées par des collages aux couleurs vives. À Montréal, remarque Fred, un artiste urbain peut gagner sa vie en vendant des t-shirts, mais à Vancouver, il semble beaucoup plus facile de se faire remarquer. Fred me raconte l’histoire de l’œuvre. « Les personnes qui sont sur Hastings… beaucoup sont des francophones, des Québécois. Tu peux entendre des gros accents québécois. » Il fait une pause et me regarde avant de continuer. « C’était une image très très très forte pour moi. » Je jette un œil à la peinture. Sa perte d’innocence, mêlée à mes souvenirs d’enfance, me fait froncer. Ce Charlie Brown, peut-il être la voix des ceux qui en manquent ? lonté commune de mettre leurs œuvres « à la rue », à portée de nous, pour ajouter à la complexité de la ville. Et peut-être serions-nous inspirés de les regarder de plus près. Lorsque décrite par les mains qui l’ont créée, une jolie peinture devient une œuvre pleine de sens. Les artistes philippins du groupe Dimasalang, qui exposent actuellement à la galerie Moat de la bibliothèque publique de Vancouver, présentent à La Source leur art et le sens de famille qui les unit, avec l’envie d’élargir le mouvement au-delà de la communauté philippine. Ses yeux vous fixent. Ils ne quittent pas les vôtres. Elle n’a pas plus de dix ans, mais son expression suggère des émotions plus complexes que celles d’une si jeune fille. 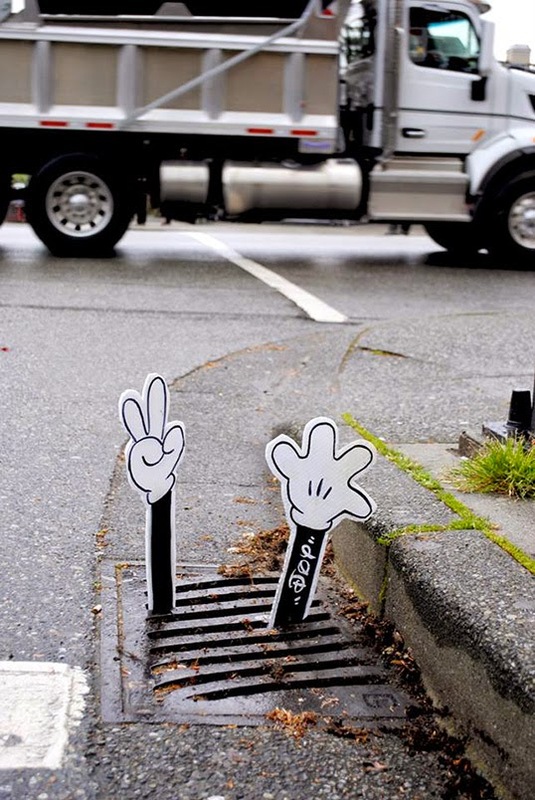 Elle ne sourit pas. À quoi pense-t-elle ? Techniquement,Strong Willed par Mina dela Cruz est remarquable – les mèches de cheveux caressées par la brise légère, le détail des plis de sa manche froncés autour de son bras, le rayon de soleil qui touche doucement son visage… La peinture se grave dans mes pensées. Leo Cunanan Jr., par contraste, affiche un grand sourire en me serrant la main. Au cours de l’entrevue, il devient évident que ce sourire ne quitte pas souvent son visage. Il fait partie du Dimasalang, un groupe d’artistes philippins basé ici, en Colombie-Britannique, qui a pour lien la peinture et le dessin. Le mouvement a monté une exposition de ses nouvelles œuvres intitulée Dimasalang Expressions, qui est à l’affiche jusqu’à la fin du mois à la galerie Moat de la bibliothèque publique, au centre- ville de Vancouver. Les techniques des œuvres sont diverses – des dessins au fusain côtoient des peintures à l’huile sur lin et à l’acrylique. De paysages canadiens au Défilé de la fierté gaie en passant par des œuvres abstraites, la diversité des expressions réjouit les visiteurs. Sym Mendoza son oeuvre The Flight. Alors que je suis sur le point de partir, Trouver le nom de Rod Pedralba accroche mon regard. Une jolie mannequin philippine s’y assoit devant une scène tirée d’une œuvre espagnole bien connue aux Philippines. À côté de la peinture, une œuvre en hommage à Emily Carr, peinte avec cette technique cubiste propre au groupe. La fusion des patrimoines a commencé et elle est belle.